Remember Invincible Man? He was really a Skrull, disguised as Sue and Johnny’s dad. Well, he’s back. 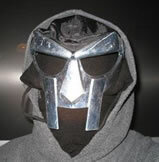 Dr. Doom! Only, again, he’s not. Or he is, but he’s in a different body. The big reveal at the end of issue #287 is that Dr. Doom is back, and he summons The Beyonder because Dr. Doom is wicked smart with magic, there’s some time stuff, but really as soon as I see Beyonder I kinda tune out because I know it’s not going anywhere. And it doesn’t. Not the best work of John Byrne’s FF.